Fresh for spring, we are delighted to welcome London-based artist Michèle Jaffé-Pearce into the gallery for the first time. Celebrating the energy and beauty of nature, her multi-layered oils burst with colour and movement. From the rocks that root us to boundless space above, Jaffé-Pearce aims to take the viewer on a journey of discovery. Experimental in style, Jaffé-Pearce fuses oils with mixed media techniques, from pastels to threads, inks and sprays. The title of the exhibition stems from her ‘Rocks & Stars’ series of paintings, a response to images streamed to Earth from the International Space Station. Of the oil and ink on canvas, ‘Rocks & Stars I’ (above) she says: “It’s entirely my take on the extraordinary atmospheric optics that occur in space. 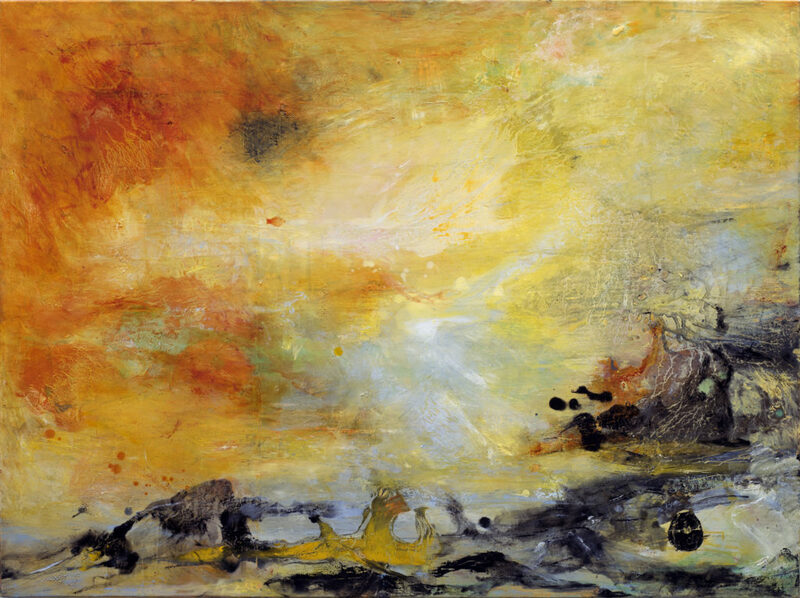 Influenced by Turner’s palette, this multi-layered painting achieves its exhilarating, organic feel through poured mixes of oil and inks, along with air-blown paint “so that each layer reacts differently with the other [and there are] worlds within worlds”. Other works (the ‘everything between’) capture the wild winds of an Irish landscape, the rhythm and flow of seas and rivers and the restless movement of the skies. 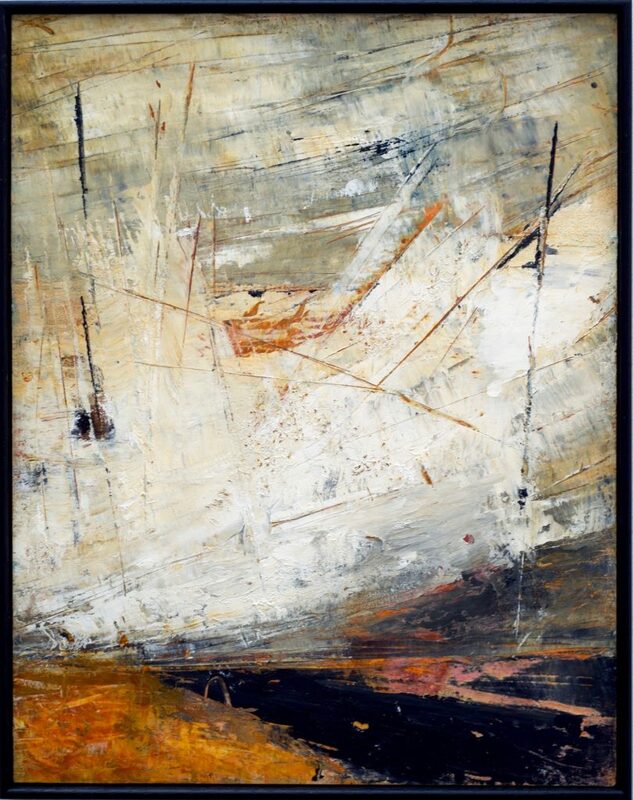 ‘Atmospherics I’ (below), for instance, is an oil, cold wax and pure pigment powder piece on board, inspired by the “ever-changing light and weather” of Ballinglen, County Mayo. Evocative companion pieces (such as ‘Teruah – Wake Up’ (below)) explore the hope and renewal that combine in Jewish mysticism and Japanese philosophy – both deeply embedded in the notion of nature as spiritual force, and huge influences on Jaffé-Pearce’s work. Jaffé-Pearce studied Fine Art at The Cass – the Sir John Cass School of Art – and Chelsea School of Art. A former features journalist for women’s glossies and broadsheets including The Sunday Times, she has forged a successful career as an artist. In 2012 she was invited to exhibit alongside acclaimed British abstract painter Day Bowman in ‘Belief & Beyond’, a London show curated by Jenny Blyth, curator at The Saatchi Gallery during the YBA period. She has exhibited widely, including at The Gallery on Cork Street and Mall Galleries. 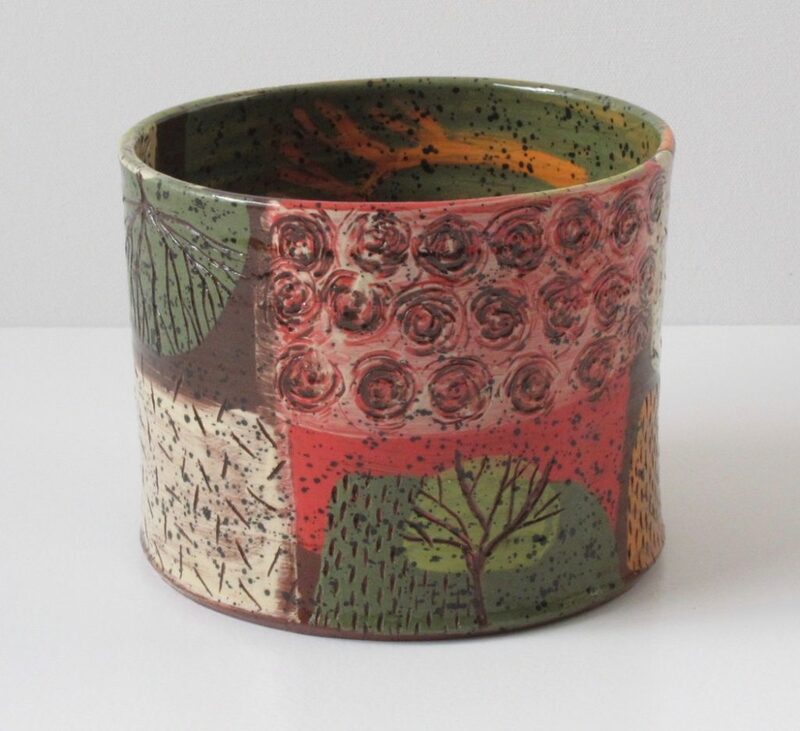 Alongside Jaffé-Pearce’s work, ‘Rocks & Stars (and Everything Between)’ will also feature the landscape-inspired ceramics of artist and potter Isabel Merrick (below). Her earthenware cups, bowls and vessels, described as “mini landscapes”, are inspired by the beauty and movement of the Devon countryside where she lives. Merrick uses coloured slips in a painterly fashion, thinly for translucency and thickly layering them to get density, using sgraffito for mark-making and drawing. These tactile, richly-hued pieces sit beautifully alongside Jaffé-Pearce’s similarly nature-infused. vibrant artworks and combine to create a stunning and joyous new show. Join us for a special event on Saturday 6 April, when we will be hosting a ‘Meet the Artist’ afternoon with Jaffé-Pearce. Enjoy a sneak peek into the techniques and inspirations behind her painting and a discussion of the influences that guide her – from Japanese philosophy to Jewish mysticism (see our Q&A for more). Michèle Jaffé-Pearce, ‘Rocks & Stars (and Everything Between)’, For Arts Sake, March 21 – April 14, 45 Bond Street, Ealing, W5 5AS, Mon-Fri, 10am-5.30pm, Sat 10am-6pm, Sun 12-5pm; ‘Meet the Artist’, Saturday 6 April, 1-5pm. Email [email protected] for more information on the works available and to RSVP to our ‘Meet the Artist’ event.